Cuban flag fell today in Venezuela, an omen? In the past few weeks in Venezuela, Cuban flags have been burned in protest of the Castro dictatorship's presence in Venezuela that amounts to a colonial power. One can understand that seeing ones flag disrespected would outrage any patriot. Today we saw the Cuban flag hit the ground when it was being raised as part of an honor guard for Raul Castro. A number of questions arise. What was the greater insult to the flag? Having it hit the ground or having it involved in an action honoring a dictator? ... I was not properly reared, and had the illusion that a flag was a thing which must be sacredly guarded against shameful uses and unclean contacts, lest it suffer pollution; and so when it was sent out to the Philippines to float over a wanton war and a robbing expedition I supposed it was polluted, and in an ignorant moment I said so. But I stand corrected. I concede and acknowledge that it was only the government that sent it on such an errand that was polluted. ..
Over the past 55 years the Castro brothers have identified the Cuban flag with a totalitarian dictatorship that has murdered thousands of Cubans at home for wanting to be free. Over seas the regime that claims the Cuban flag as its own has presided over mass slaughters, defended genocidal tyrants, and wherever human rights have been violated have sided with the violator - with the one exception of South Africa - that fit into its Cold War aims to oppose the Apartheid regime. However in Ethiopia they aided a war criminal who was later convicted of crimes against humanity. Venezuelans understand that the hand of Cuban intelligence trained and is guiding the snipers who have shot student demonstrators in the head and that the Castro regime is building a totalitarian edifice to enslave the people of Venezuela as it has done so with the people of Cuba. Unfortunately, the Cuban flag predates the Castro regime and it represents the Cuban people and like the Cuban people the flag has been taken hostage and used to serve the shameful and unclean agendas of the totalitarian dictatorship in Cuba personified by the Castro brothers. Mark Twain offered a modest proposal which could easily be applied by the Castro brothers for both Cuba and their Venezuela colony, the white stripes replaced with black and the star replaced with a death head. 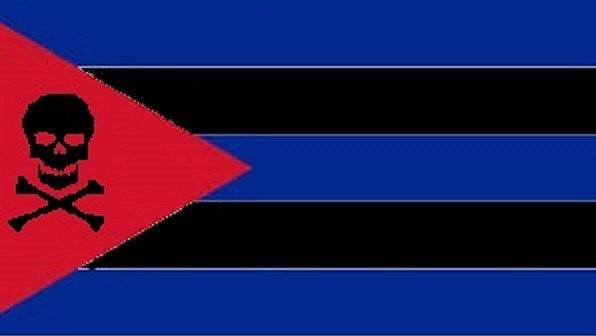 This flag represents the Castro dictatorship. After 55 years in power the regime deserves to have a flag that represents its legacy and the impact it has had on Cuba both domestically and internationally. The three blue stripes, no longer represent the original three provinces. They now represent the bodies of water that surround Cuba where there are estimates that as many as 100,000 Cubans have died fleeing the dictatorship: the Gulf of Mexico, Atlantic, and Caribbean. The red color is the innocent blood shed to keep the dictatorship in power. The skull and cross bones have a triple meaning. The obvious is that it signifies death which has been a driving force of the Castro regime for the past 55 years but also a warning that this country has been occupied by a poisonous ideology and lastly the pirate nature of the regime looking for plunder in other lands (like Venezuela). The black stripes signify the totalitarian pollution visited on Cubans by the dictatorship. Dividing families, forcing children to spy on their parents. Finally the red triangle is a warning sign that combined with the skull also signifies that this is a dangerous area. Under the Castro regime cholera has become a persistent problem that the dictatorship under reports. The Cuban flag represents the Cuban people who have suffered under a brutal dictatorship for 55 years. It is important for friends of freedom around the world to understand that it is not the Cuban people who are engaged in these evil acts, but the Castroites led by Fidel and Raul Castro who terrorized and enslaved Cubans in a totalitarian regime. Castro Incorporated will most likely not adopt this flag but nevertheless it does represent their legacy. Please share it with others when discussing the dictatorship and use the Cuban flag when discussing its embattled democrats.